Windows 7 has been heralded as a genuine success for Microsoft. It’s apparently been selling like cupcakes and has received a much more positive response than its predecessor, Windows Vista. It’s also been able to generate public interest in a way Vista was never able to do. Compare the two and Windows 7 comes out on top with a bruised and battered Windows Vista laying at its feet, whimpering. Just look at the below search volume graph from Google, which shows the search volume for Windows 7 compared with that of Windows Vista. 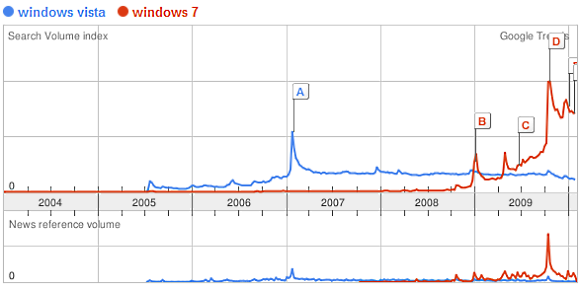 Windows 7 raced past Windows Vista in no time, and quickly passed the all-time high of Vista. It looks like Microsoft finally really does have a big hit on its hands. They have claimed it’s the fastest-selling OS in history, and that may very well be right. Here is how fast it’s growing. After being available for just three months, Windows 7 has reached a 10% market share. That’s almost double that of Mac OS X, and more than half of that of Windows Vista. Those numbers include computers that come with pre-installed versions of Windows 7, which does of course help tremendously, but it’s still very impressive. Now the only question is how long it will take Windows 7 to overtake Windows Vista in actual market share. How soon do you think it will happen? Most people just want to USE a computer. Even with Ubuntu, you miss out on a whole pile of functionalities that should just work, but have to be configured by a ‘computer guy.’ The reason open source isn’t up most people’s alleys is because they don’t want to be that intimate with the inner workings of an OS. Until open source figures that out, it’ll still just be software and OSs for the elite.